This is a dish with no history and created by my humble self. I was thinking to prepare this dish when I have guests in house. There is nothing to write about except the recipe since this is my own creation. 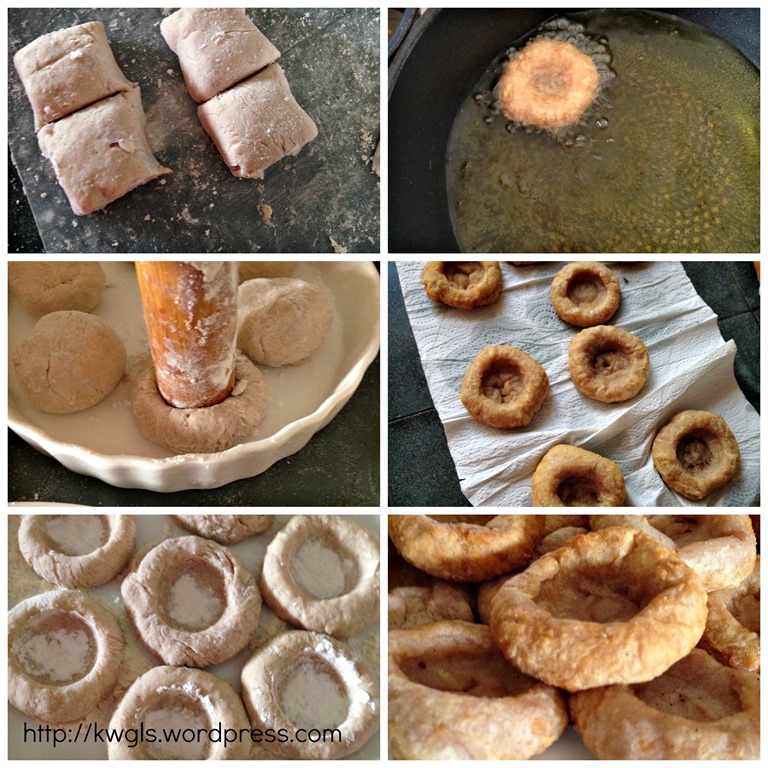 Initially, I had wanted to prepare the classic yam ring with the yam that I have bought in the supermarket after I saw a post in a Facebook Group . However, when I looked at the fridge, I found one bag of big scallops given by my wife’s godmother during Chinese New Year. 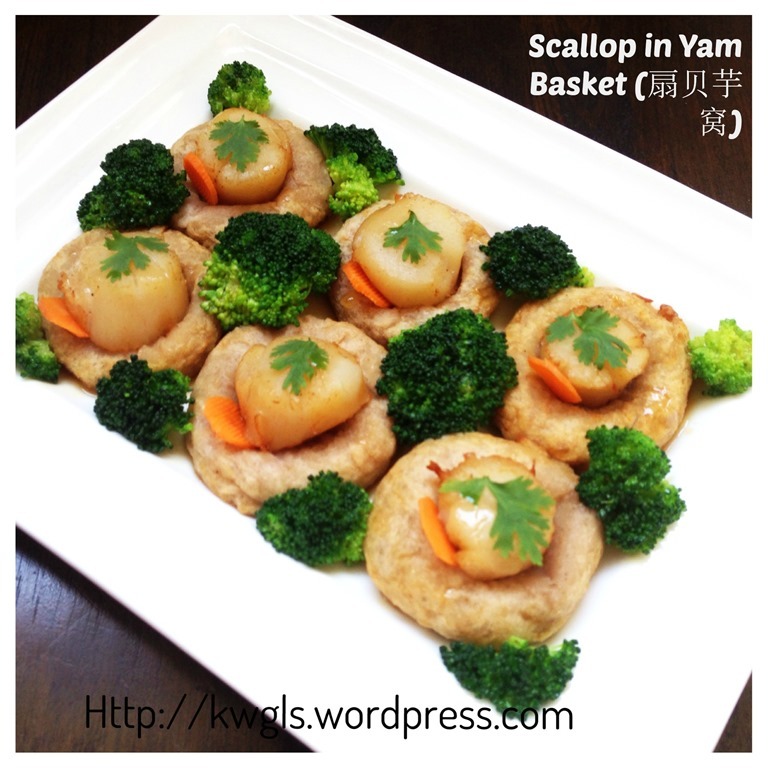 Honestly speaking, I did not exactly know how to cook these big scallops and I believed if I cooked, the taste of the scallop should be as original as possible. 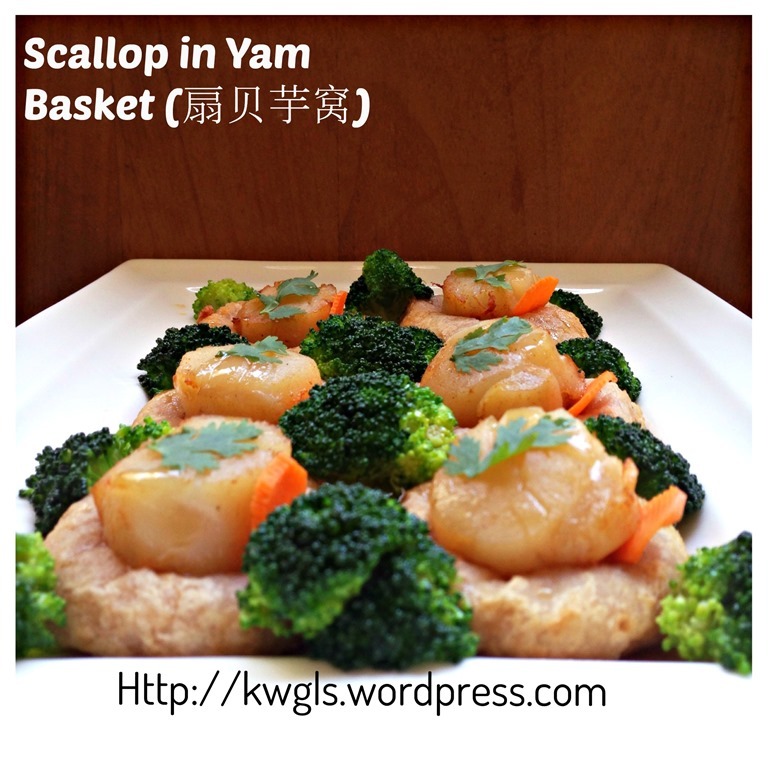 Therefore, only simple cooking is required for these scallops. 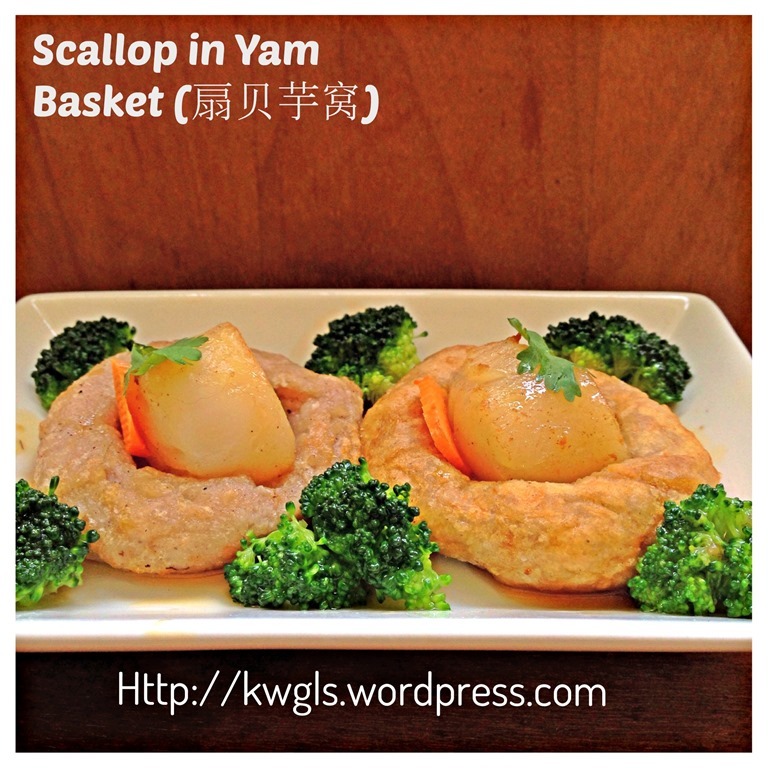 Suddenly, it crossed my mind why not I use the scallop to sit in the small yam bowl or basket. That is how I get inspired about this dish. 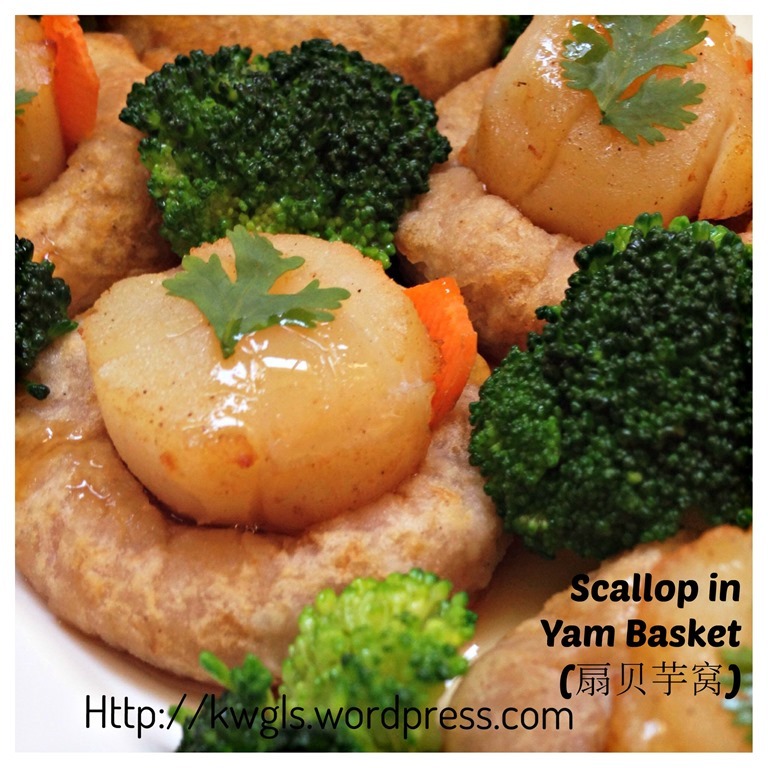 1/2 tablespoon of preferred seasonings such as mushroom concentrate, MSG, sugar etc..
8-10 scallops sizes of your choice. 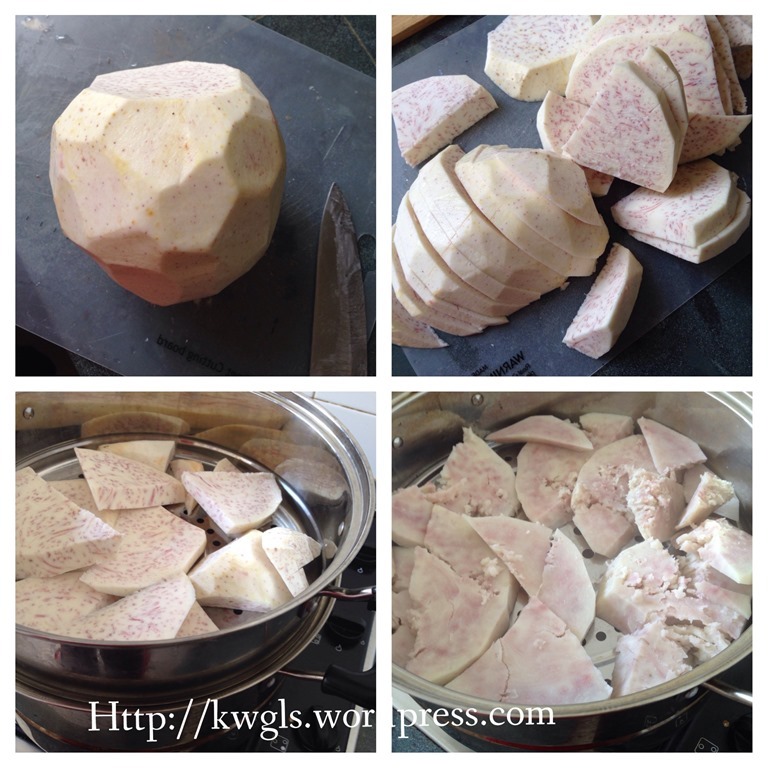 De-skinned the yam, cut into smaller pieces and steamed in a steamer until the yam is soft. Depending on the type of yam that you purchased, for some yam, you can never get soft in certain part even after the steaming, you will have to cut it off after steaming. 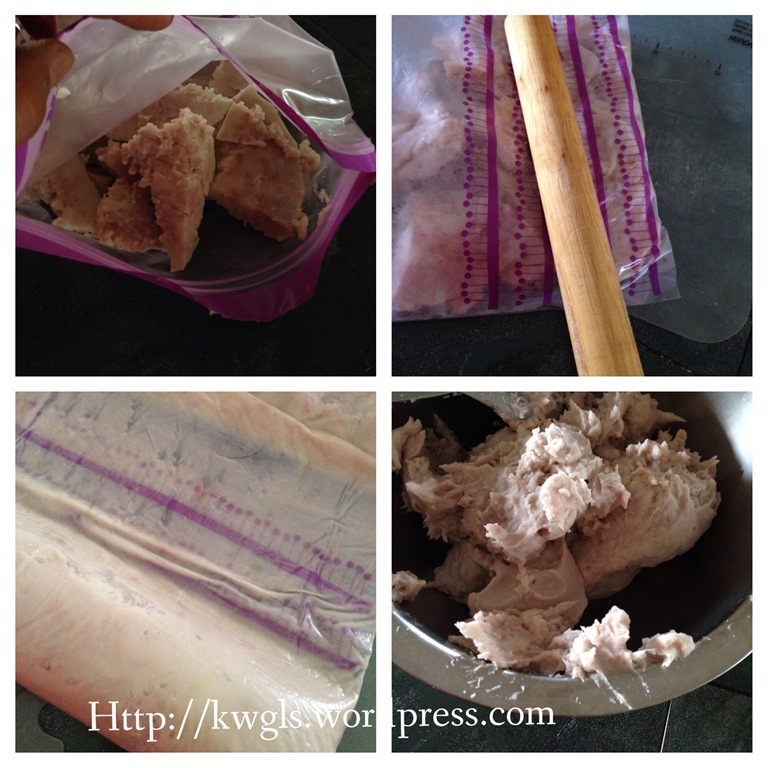 Once it is steamed, put the hot yam in a clean zip bag. Zip the opening and leave a bit of space in between to let the air escape. Use a rolling pin to roll or mash it until fine. You have to do this when it is hot, otherwise, it can turn hard when cold. This is my way of doing it this time. Alternatively, you can put it in a food processor and blend it until fine. Transfer out the mashed yam. 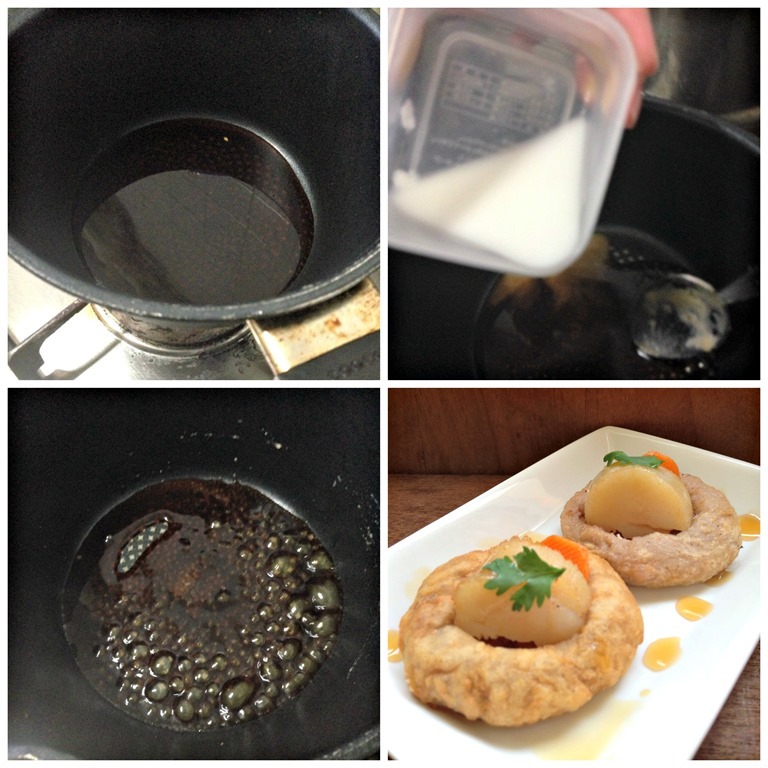 Pour the hot water into the wheat starch and stir until it resemble a paste. 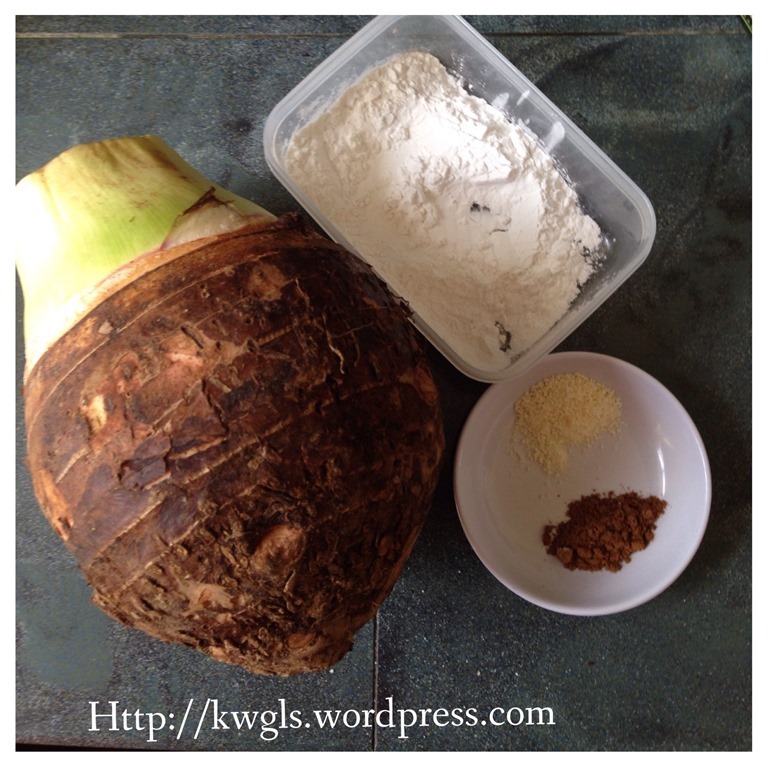 Pour the wheat starch, five spice powder, seasoning, salt and cooking oil onto the mashed yam. Use hand to knead it until it becomes a pliable dough…If it is too soft, just add one or two tablespoons of wheat starch or let it chilled in the fridge for 15-20 minutes. 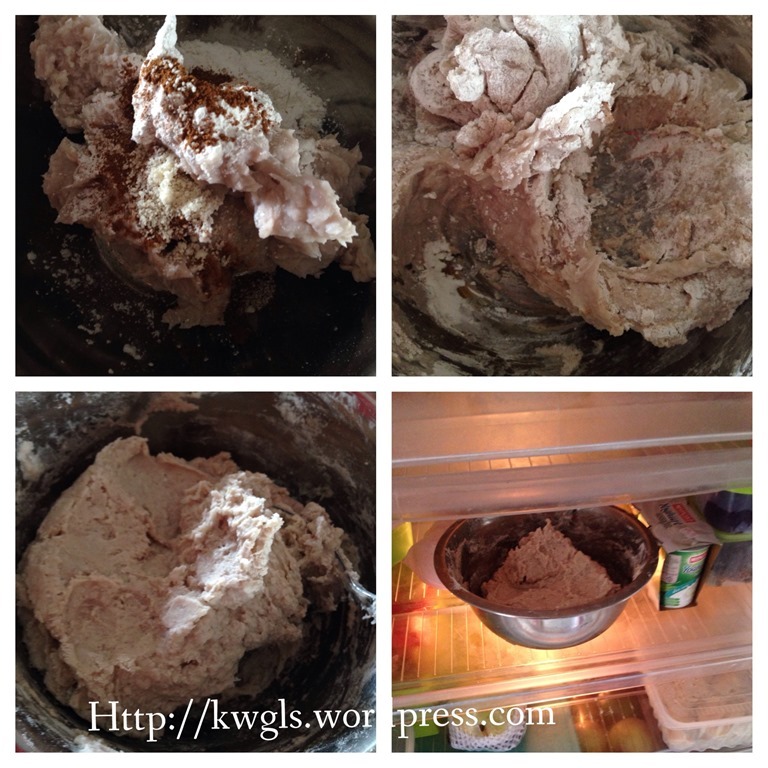 Divide the dough into your desired size. Shape it round. If it is too sticky, just dust with some wheat starch. Flatten the round ball and use a rolling pin to press on the middle and become the shape of a bowl. Deep fry in the hot oil until golden brown, drain and set aside for later use. 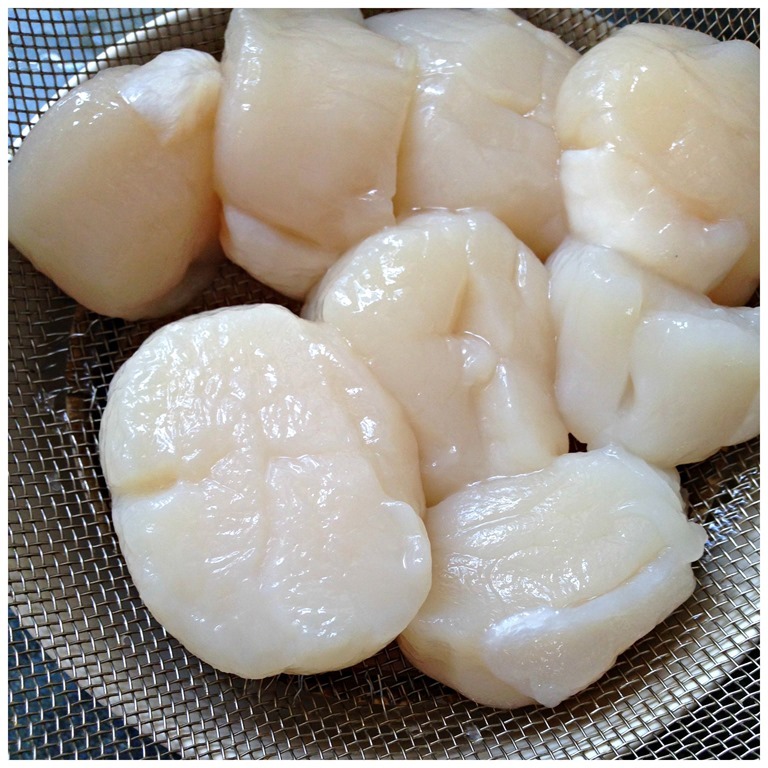 With the same pot of hot oils, blanch the scallop for 2-3 minutes until the sides start to shrink. 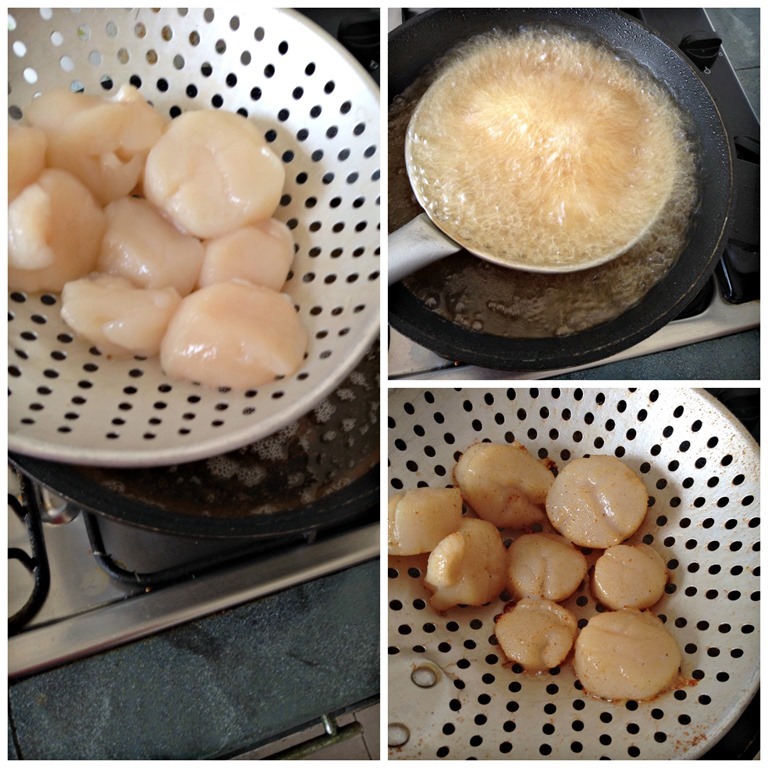 Note that scallops can get cooked very easily, and blanching in hot oil needs only 2-3 minutes. 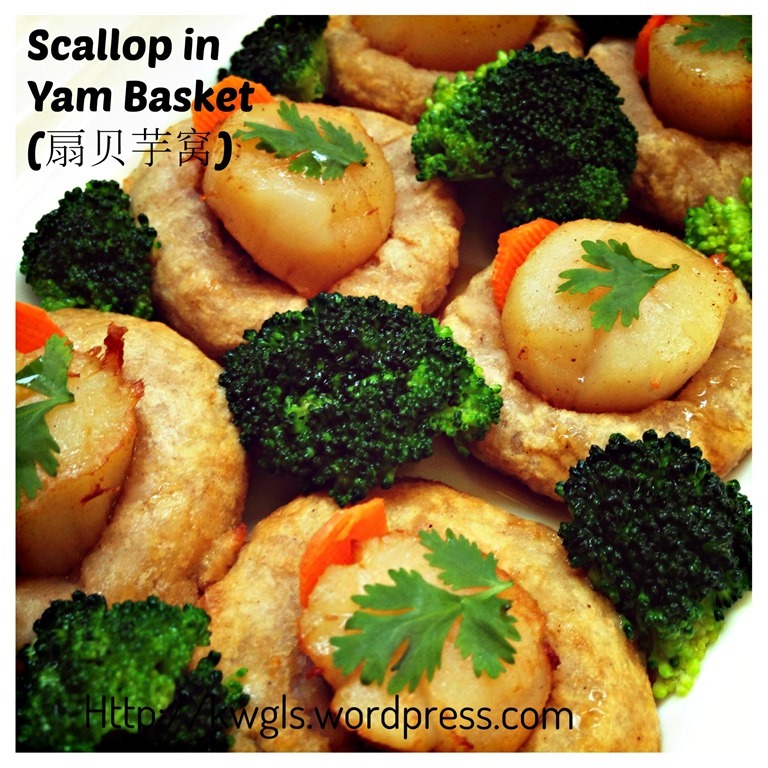 I was using oil blanching method this time because since I was deep frying the yam baskets, I might as well continue to use the oil for blanching the scallop. 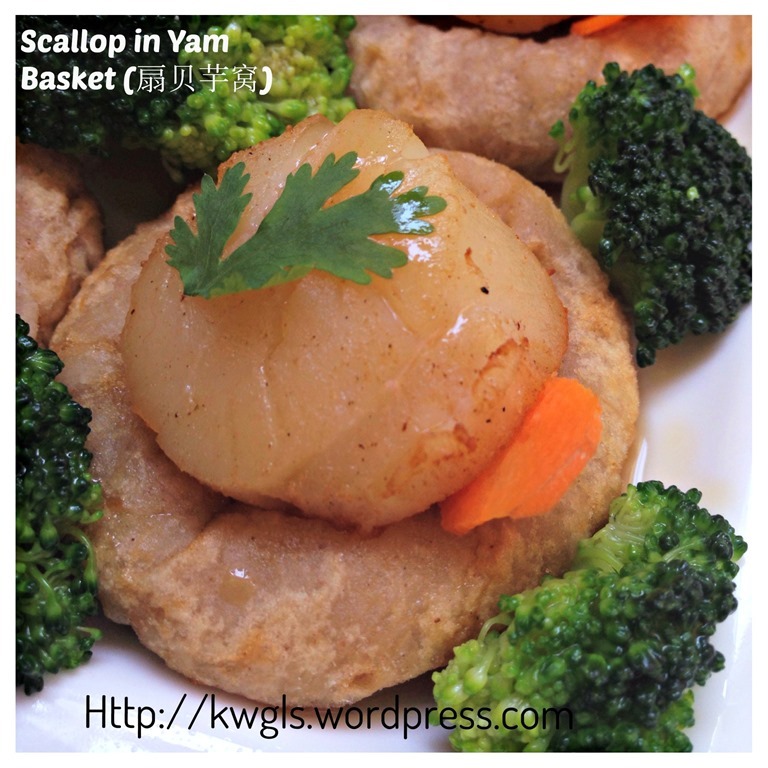 Otherwise, you can pan fry or even oven bake the scallop. 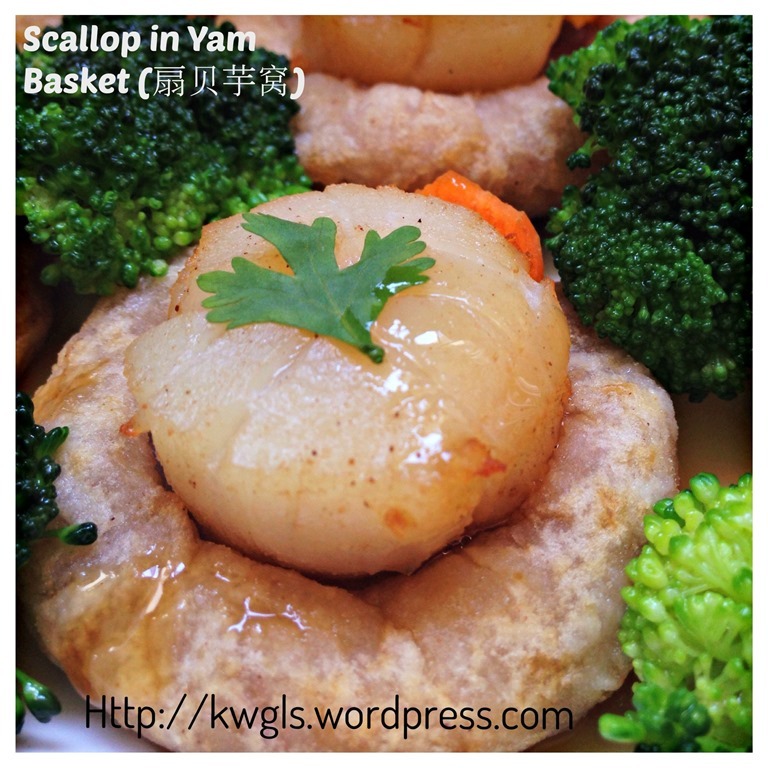 Remember that over cooked scallop will lose its juiciness and become hard or even chewy. In a small sauce pan, put 5 tablespoons of plain water. Add 2 tablespoon of Teriyaki Sauce or Korean Barbecue Sauce to the plain water. Bring to boil. Meanwhile, add 1 teaspoon of corn flour with 5 teaspoons of water to make a starch solution. Gradually pour the starch to the boiling sauce Once the sauce boil again, off the heat and set aside. 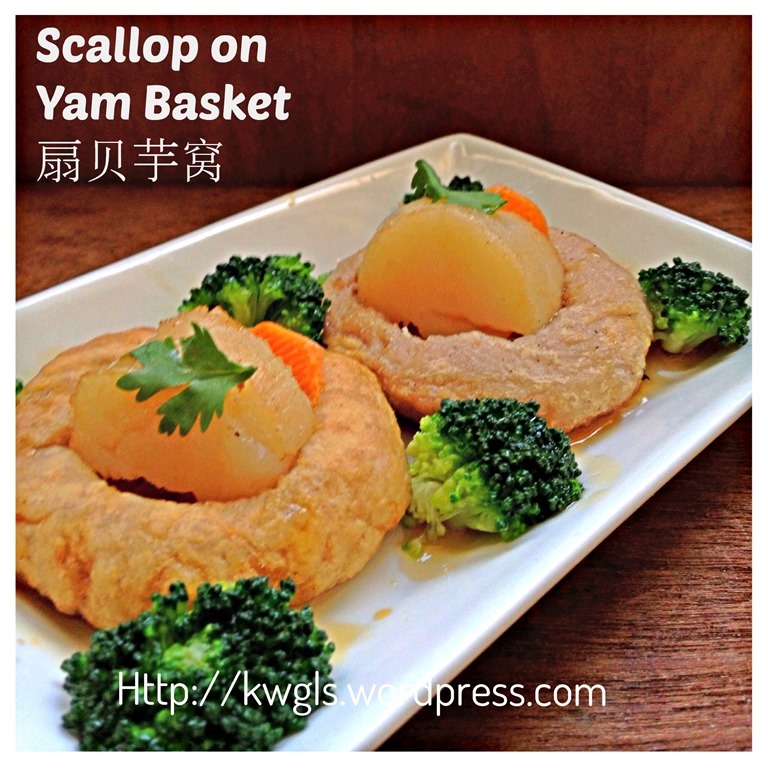 For assembly, place the yam basket on the serving plate. 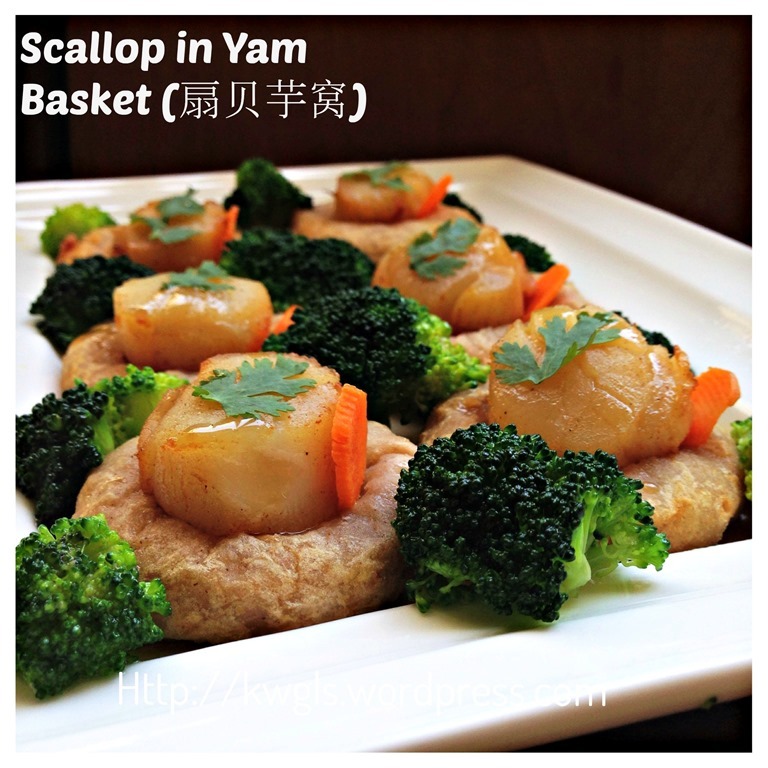 On top of the yam bowl, place one scallop each. Drizzle with the teriyaki or Korean Barbecue sauce. Garnish with coriander leaves if desired. Best served hot as part of the Chinese set meals. A presentable dish for your consideration. Hope that you like the post today. Cheers. 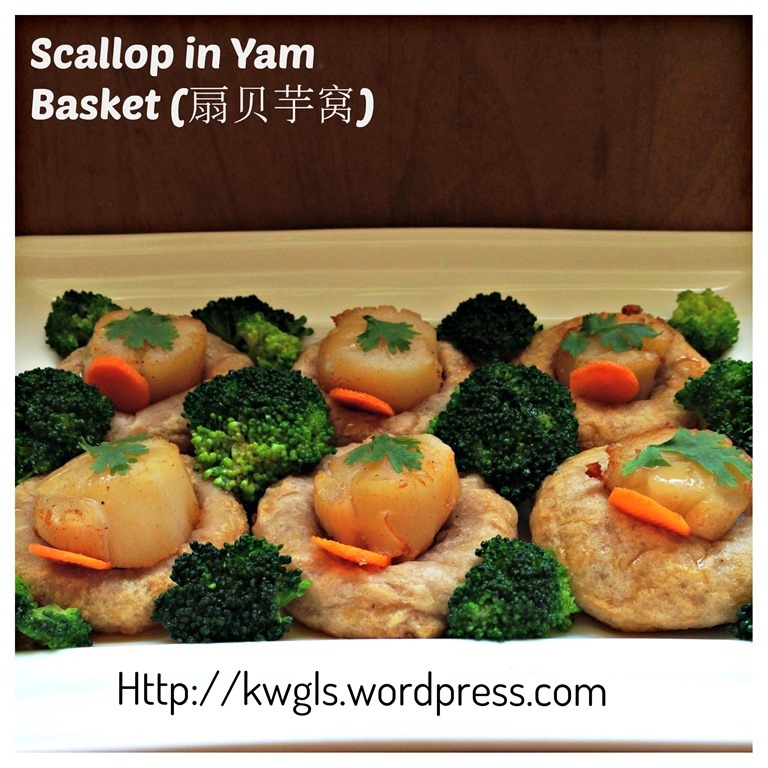 This entry was posted in Dish, Food Preparation Series, Seafood Dishes and tagged 8, GUAI SHU SHU, Guaishushu, kenneth goh, postaday, scallop on yam basket, scallops, yam basket, 扇贝芋窝. Bookmark the permalink. 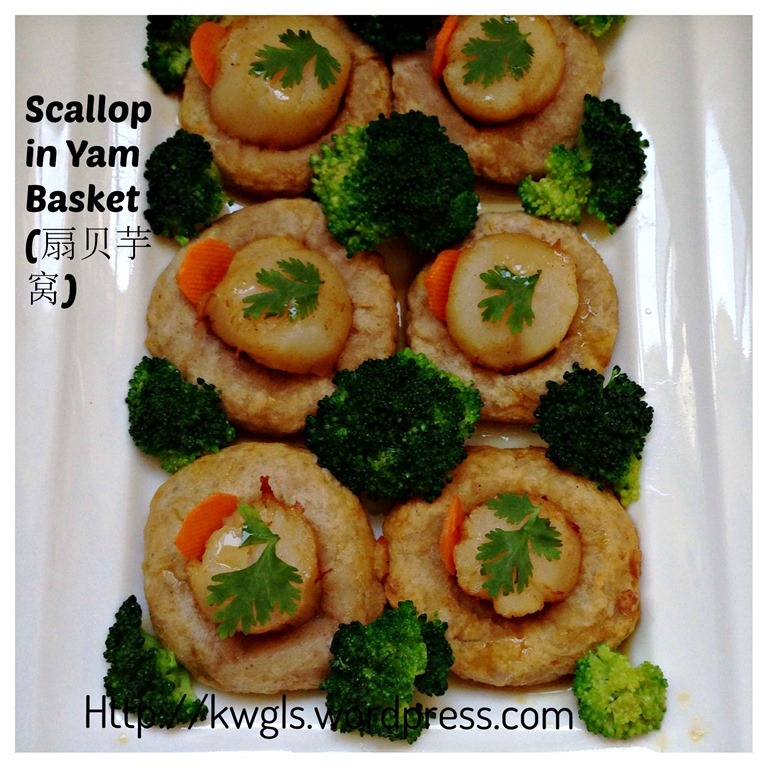 exquisite dish,love scallop, and design are very exquisite, as though in the restaurant.. I am unable to find wheat starch. Is there any substitute for it? Can use other starches as well but not as good as wheat starch.